Here's a picture from this morning. 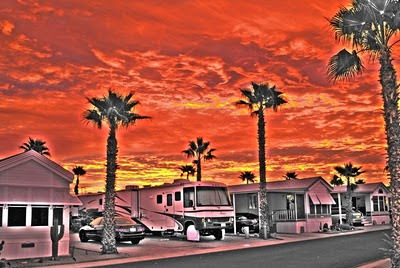 This is an HDR enhancement with a "little" tweaking! Our Tiny House is on the left. The Old Computer Geek Group meeting has been rescheduled for Tuesdays at 9:30 am in the Prickly Pear Room. The next meeting will be held on January 4. Please make a note in your calendars. We'll resume on that date, in the Prickly Pear Room, at 10 am. If you have ANY input regarding technology (mostly computers), or would like to discuss specific problems or concerns - please attend.